It’s a great treat to hear from Rick, a container homeowner with a background in real estate. 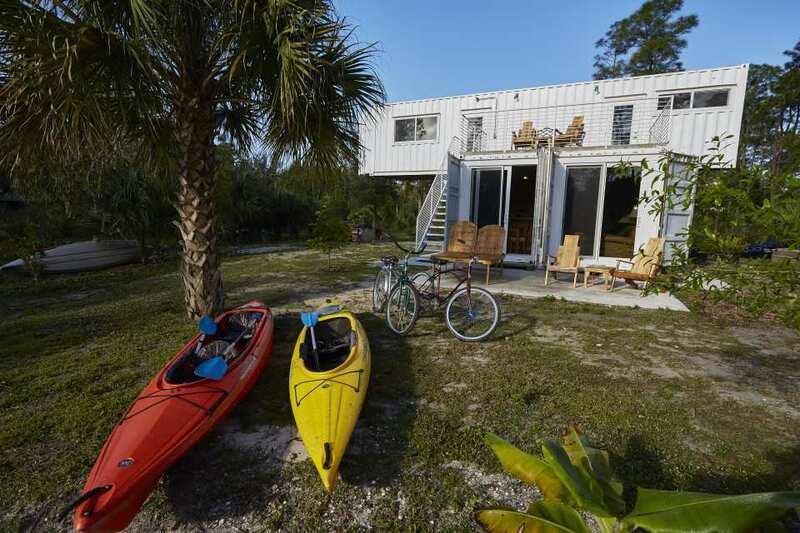 Rick built this beautiful, two-story shipping container home as a short term rental on his riverfront property in Jupiter, Florida. He has a ton of experience managing rental properties and used that knowledge to help develop his own container-based rental. You’ll enjoy hearing about the ‘genesis moment’ when he realized a container home is what he needed to build! I started the Jupiter Outdoor Center in 1997. My goal was to get people out into nature in a convenient and safe way. Core values of the business include respect and appreciation for the nurturing power of nature as well as maintaining a sustainability mindset. At one point, I’d wanted to develop something on my property utilizing bamboo as the principle construction material, which meshed nicely with our values. However, after our local planning and zoning department rejected the idea of bamboo construction, I was back to the drawing board. Fast forward to late 2010. 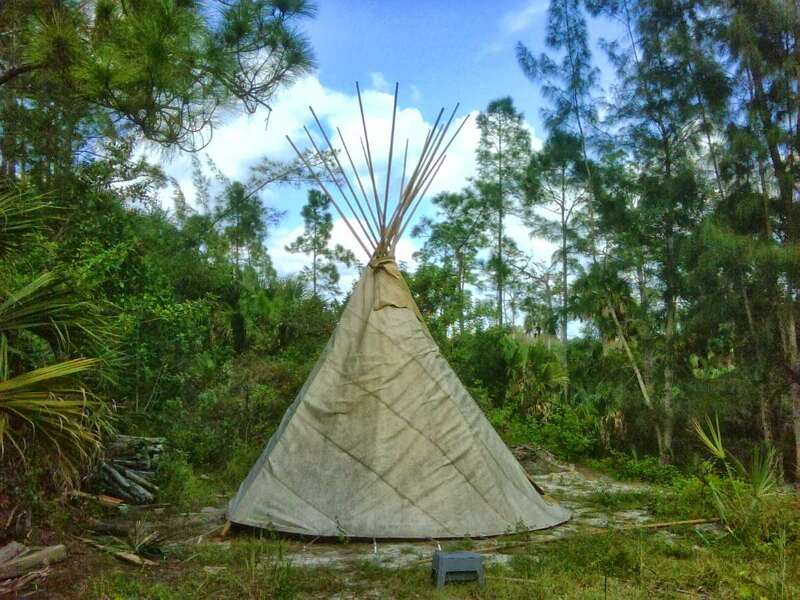 I actually spent some time living on site in an authentic tipi, further cementing my desire to get more permanent housing on the property while providing something unique for visitors. In the spring of 2011, I was on a paddling trip in Pennsylvania on the Delaware River with my daughter. 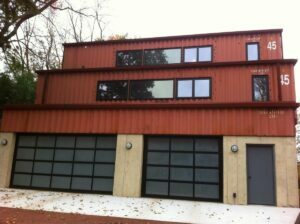 We came upon a large, beautiful container home that has since been featured in Dwell. Upon seeing this house, I immediately had a vision of a container home on my property back in Florida and was completely convinced this was what I needed to do. It was one of those lightning bolt moments, and my mind was immediately made up! 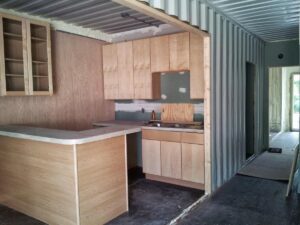 Upon returning home, I quickly began working with a local architect who had a passion for shipping container construction although he’d never worked on a project with them. For some time, I’d had my finger on the pulse of the eco-tourism market and knew there was a desire for a unique destination that coupled outdoors experiences with an appealing place to stay. I believed that the glamping (glamorous camping) market was currently underserved, and was confident that shipping containers would provide the qualities I needed. Tell us more about getting the container built. I previously developed a nearby destination restaurant called Guanabanas. Having obtained a difficult and time-consuming site plan approval for the restaurant, I knew I could make my container project into a reality. The help and encouragement of my partner at The Outdoor Center, Sharon French, was also critically important to the success of the container project. However, despite my passion and Sharon’s help, it wasn’t easy. 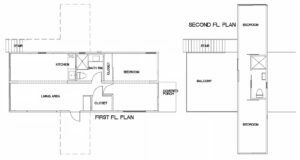 The county government initially said no to my idea for a container home for a variety of reasons that were somewhat arguable. I countered to them with the idea of building the house with traditional construction but designed to look exactly like a container home. This helped to force us to examine where exactly the issues lied. Eventually, we were able to compromise on several of the design aspects and were given our building permit. A few of the concessions we made were incorporating a more modern look, painting the exterior white, adding sliding doors to the ends of the containers, and using impact glass in lieu of storm shutters. A large part of the approval process comes down to people. There are always gray areas and things open to interpretation. Personalities drive behavior, and some people are just resistant to change. In addition, you may find yourself fighting against preconceived notions and judgements that are rooted in emotion rather than fact. The idea and design were actually quite polarizing. Some government officials thought the project was really cool, and others were very resistant. When it comes down to decision makers though, you also have to deal with that person’s willingness to accept the professional and reputational risk. It’s often easier for someone to just say ‘no’ than it is to understand something new, try to fit it into the existing framework, and work together to get to ‘yes’. Eventually, we did get all the boxes checked and were able to start and then complete the build! To understand the design, you have to understand the context of the location. 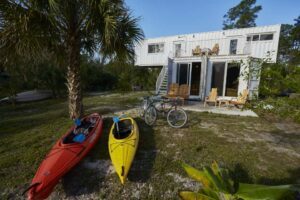 I have two acres of riverfront property along the headwaters of the Wild and Scenic Loxahatchee River in Jupiter, Florida that sits across the river from Riverbend Park. Incorporating views and access to this natural resource and recreation opportunity were very important. Based on my knowledge and research of the local market, I knew I needed to have room for at least eight people to sleep in order to create a broad rental appeal. I also knew I wanted to utilize patios and decks to take advantage of the incredible river views of my property. Initially, the design was just two adjacent containers on a single level. However, it looked a bit plain and I decided I needed something a little more exciting. We changed the design to add a third container on a second level, perpendicular to the first two and cantilevered out on both sides. This also provided additional floor area as well as more indoor and outdoor elevated views of the river. It did mean that my architect had to get a structural engineer to prove to the local government that the upper container could withstand the wind load, but this cost less than $500. The design also reflected my idea to allow the cohabitation of separate groups renting individual bedrooms with a shared common/living area. Features like a collapsible wall allowed for the space to be reconfigured depending on how the various spaces with the house were rented. I tried renting it this way for about a year with limited success, but began to find that people wanted to have the entire structure to themselves. 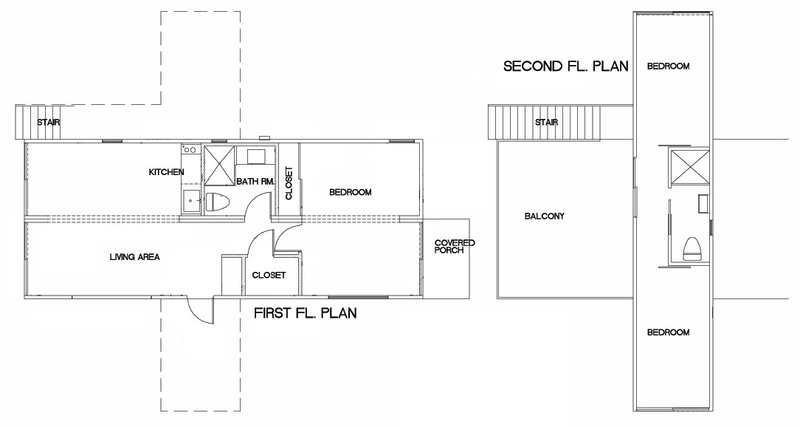 With some minimal internal reconfiguration, I was able to offer the whole house as a single rental unit. We used spray foam insulation in the walls and ceiling on the interior side of the container skin, maintaining the containers’ external appearance. However, in hindsight, I wish we had insulated the outside of the roof instead (on top of the container skin). This would have enabled us to have the containers corrugated roof visible from the interior. There are still exposed parts of the container skin on the interior wall between the two containers though. 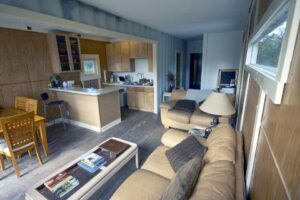 After I returned from the previously mentioned Delaware River paddling trip in mid-2011, I got to work applying swift and massive action toward my container home idea. By December 2011, we had received the approved building permit. The containers were brought on site in mid-January 2012. The building process was a drawn-out over almost two years, although six months of that time was due to modifying the plans to add the second floor. The Certificate of Occupancy was finally granted in December 2013. I did hire a general contractor to help us get the building permit, but they had limited involvement afterward. I supervised most of the work with the help of friends/family. If I had to estimate, I’d say we did about 70% of the construction ourselves and used contractors for about 30% including electrical and plumbing work. We finished the project and were open for business by January 2014. As a DIY project that was self-financed, it was obviously a slow project. As I think about some possible expansion opportunities in the future, I’m evaluating using a large container builder. They could provide a partially or fully finished building for us, which might be a better fit for how I value my time vs. my money. The overall project cost about $100,000. I actually estimated it would cost a bit less, but we went a little overboard in a few areas. One big one was the foundation, where we poured a concrete slab under the entire footprint of the containers at an approximate cost of $10,000 (including sidewalks). In hindsight, we could have just used footings and saved a lot. Adding the second story after the project was already underway contributed a bit to the cost escalation. Looking back, I probably would have just finished the original single-story design and then completed the 2nd story as phase 2 at later date. 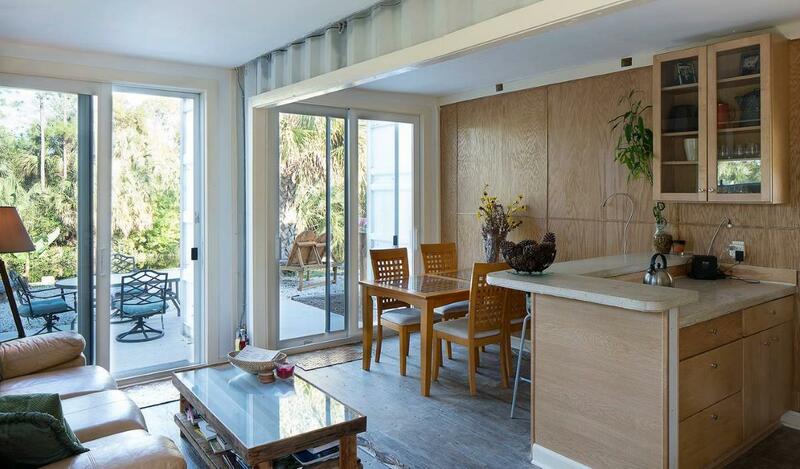 This flexibility is a big advantage to building with shipping containers. As your needs change and you have more resources, it’s easy to add on and expand. 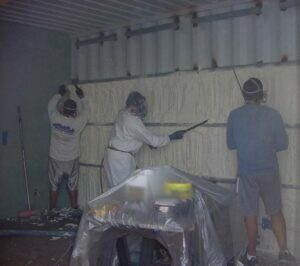 The three 40ft high-cube containers themselves were $3000 each including delivery from Miami. The containers had only made one sea-voyage from China but were used domestically for a while. They had a small amount of wear and tear but were in generally good condition. After four years of operation, we’ve had hundreds of guests from over a dozen countries. We’ve even started to have return guests. The first visit is often driven by the uniqueness of the containers, but the later visits are more about the outdoor experiences offered by my location on the river. We use Airbnb for about 70% of our bookings, but we do also get a few visitors from Glamping.com and Glampinghub.com. It’s hard to know if building with containers vs traditional construction has been an overall net benefit or not. I get a lot of great feedback from guests about the containers, but I have to wonder how many people see the containers and never make a booking based on preconceived notions about what it might be like. Kind of similar to some of the people who were initially resistant to helping us get the building permit. With all that said though, I’m 100% convinced that using shipping containers for the project was the right decision. 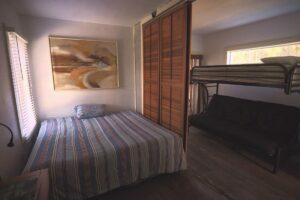 It’s truly been a delight and pleasure to host short term renters in our container home. We’ve had so many unexpected, wonderful things that have happened as a result, and a lot of that has been meeting some really cool people. In my experience, the type of people that want to experience living in a container have been some of the coolest people on the planet. I think the combination of using licensed contractors for things like roofing, spray foam insulation, electricity, and plumbing, while doing simpler tasks myself, was an effective strategy. However, as I mentioned before, in my own personal situation, it would probably make more sense to have a container builder do more of the work offsite and deliver a 60-70% completed product. It would have definitely been faster, and perhaps also a higher quality product for less money. Making this decision really depends on each person’s available time, money, and DIY skills though. Thanks again to Rick for sharing his container home that creatively takes advantage of nature’s beauty nearby. Let us know what you think about his design and his rental experience in the comments below.